I am rapt to be guest blogging for Critical Mass. How fantastic to be part of this project capturing the Queensland Music Festival, as it happens with keen music and cultural appreciators, participants and reviewers from around Queensland. Thanks to the very talented Fiona Crawford for coordinating this project. This article is being stored here for my records, but please go make your comments at the Critical Mass site, or repeat any comments over there as that is where all the discussion is taking place. Check out the other great blogs on the festival and support your blogging team. 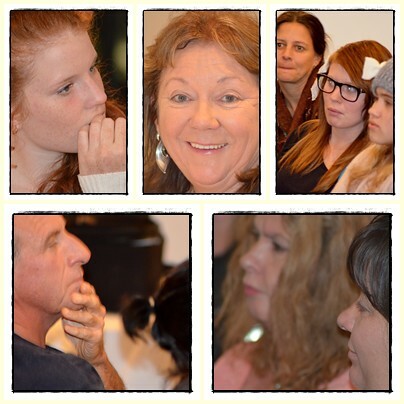 Song Trails brought together a group of around 40 people from Innisfail, Tully, and Mission Beach. Many were still in recovery mode from the cyclone but keen to develop their song writing skills. The workshop was in three sections and went for four hours. I am going to devote two posts to it as we not only learnt tips of songwriting, but went through the amazing process of group creating a song. This proved to be very theraputic for some of us. I hope at the end of these two posts, you will be excited and understand the process that made it possible for a two groups, lead by our presenters, to create two songs in four hours to contribute to the Sunday broadcast of Song Trails. Imagine you could listen to skilled songwriters informally explaining their craft by bantering with each other and expanding on each others’ thoughts. Would you go listen to pick up their secret songwriting tips? Well that is just what 40 excited community members of the Cassowary Coast did on a Wednesday night. We were a diverse bunch, including men, women, youth, mid- lifers, parents, those already in a band, musicians, local Mission Beach performers, those who’d never written a song before, writers without music, and experienced singer songwriters. 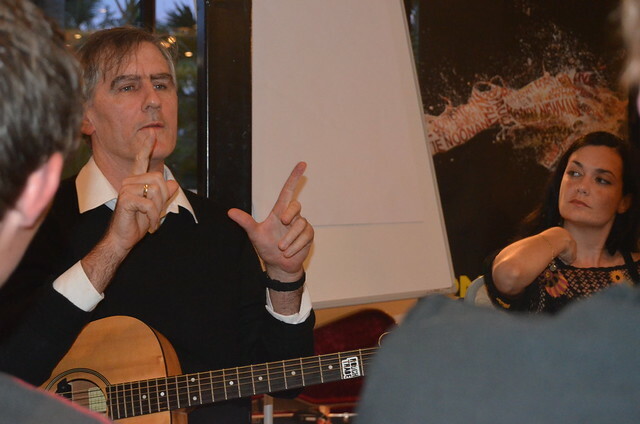 We had access for one evening only to seasoned and inspirational Australian songwriters Peter Farnan, Rebecca Barnard, Robert Forster, and (one very new but no less awesome on the Australian music scene) Leah Flannagan to guide us through the process of songwriting. 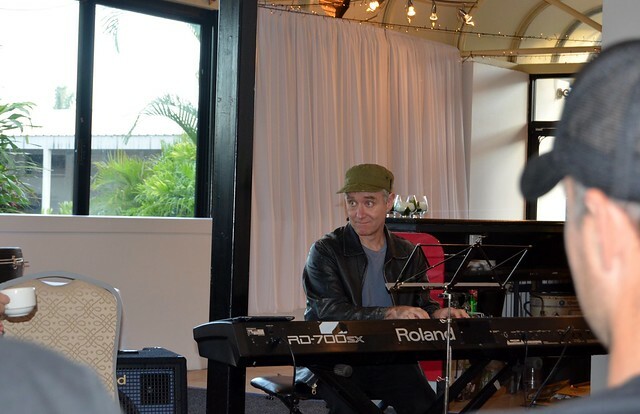 Farnan, of Boom Crash Opera (a pop rock band formed in Melbourne, Australia, in 1985), began the evening by sharing his own biography. It demonstrated both his longevity and flexibility in the music industry. He currently does musical theatre—not necessarily just writing songs, but also creating soundscapes for the stage. Farnan performed a song, the title of which he said was going to be obvious because the phrase was repeated often enough. And it was: ‘I am sorry’. He confided that he had never performed this one live, but only on his album. Some of the lines were very clever, such as I am sorry for ‘bad acting’ and ‘coughing with kissing’, and the song had a cool texturing building to a crescendo of sorries and with a surprise ending, which I won’t spoil for you but instead encourage you to listen to the song. Farnan explained this was a ‘list song’. He then rattled of a list of list songs, including I am the very model of Modern Major General from Pirates of Penzance and My Favourite Things from The Sound of Music. He pointed out that list songs have an obvious coherence to them. Rebecca Barnard, previously of Rebecca’s Empire, a Triple J Band of the 1990s, grew up in a musical family. Her dad was a jazz musician, so she was always encouraged with her music, although her mum briefly advised her to look at other options. She spoke to us about songs born from sorrow and how although she has had many happy moments in life, often the saddest moments, like the break-up with her partner, are what encourage the birth of a song. Some of the panel nodded their heads in affirmation as she said this. Barnard spoke a little about the ‘pram in the hallway being the killer of creativity’. That is: the challenge of balancing motherhood with creativity. Barnard works a solo artist now and has released the album Fortitude. She played a love song for us that touched upon this theme. She explained the usual instrumentation of the music as she was going along, ‘there’s normally a clarinet here’. She highlighted that the repetitive phrase of her song ‘You are loved’ as the basis of its structure. 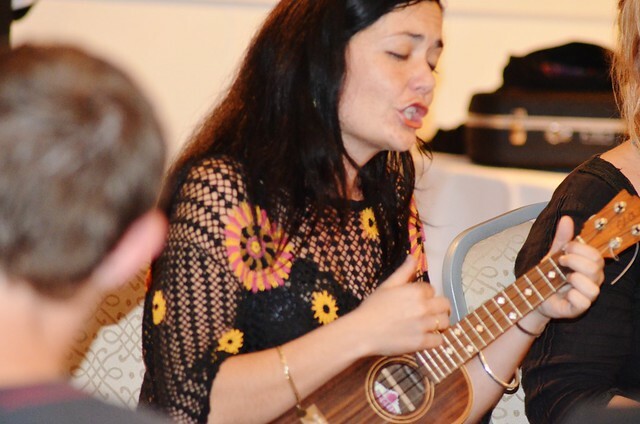 Both Farnan and Barnard showed how a song’s words breathe with musical phrasing and breaks—something that was to be later employed by Farnan in one of the group compositions. Barnard’s advice for song writers was to not be bottled up and to have a ‘whoosh of creativity’, while Farnan said he liked songs which have a ‘commitment to mood’. This was what he found attractive in Barnard’s work. Barnard explained that repetition she used to fear, but she had come to accept with age and experience this was quite okay in songs. Robert Forster, by contrast, grew up in a sporty family. He was attracted to the guitar at 16 when all of his friends took it up and so he followed suit. He initially loved playing Cat Steven’s songs. He noticed that there were many guitar players who were better musicians than he was, and felt that to have a career he would need to add something to his skills. He became part of the Go-Betweens (Australian band formed in 1978 influenced by Punk) and wrote songs so as to stand out from the crowd. Forster played a ‘water themed’ song for us. Surfing Magazines had a strong catchy bass riff in between words and a wordless, cruisy chorus (which we all sang along with). It is based on the fantasy of surfing life epitomised by surfing magazines. Forster explained how the compositions of this song began with the musical riffs, chord structure, and no words. He was in Germany at the time. He kept looking for lyrical inspiration. He wondered what would fit the music, but had no luck so he stopped three times to gain relief in his song writing efforts from glancing through a surfing magazine and then epiphany. He knew the song was there all the time right under his nose: it was the surfing magazine. Forster was keen to tell us how songs often are a truth or detail from everyday life that become stranger than fiction when they are inserted into a song. Farnan expanded on this idea and said that many of the best songs paid attention to ‘details’ that bought the song to life. He said many of his students in songwriting classes bring a description of the song they want to write, which then needs these details filled in. The mission of The Black Arm Band is to perform, promote and celebrate contemporary Australian Indigenous music to the highest possible professional standard as a symbol of resilience and hope in the spirit and action of reconciliation. 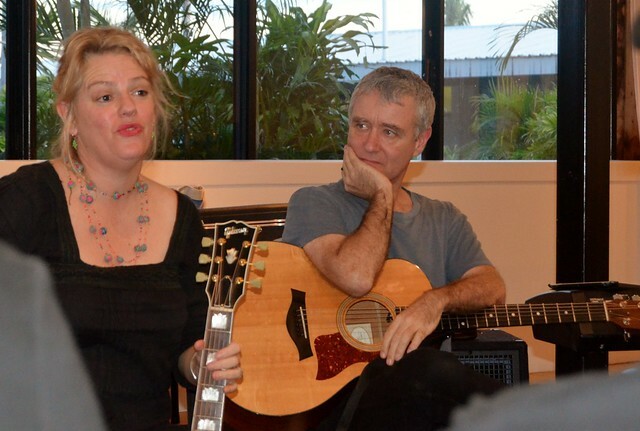 Flannagan grew up in Darwin and shared that her songwriting has a strong sense of her home and surroundings in it. The song she shared with us, by contrast to Forster’s, was written quite rapidly, and only took an hour. But Flannagan explained that is something that can happen with a song sometimes it can just come into being quickly. Flannagan started the song’s composition playing her guitar, but then switched to her ukulele and then it just happened. For Flannagan, writing from what you know is a great place to begin songwriting. She demonstrated this in her upbeat ukulele song describing the Darwin sunset and the observing the ‘softened silouettes’. It has such a relaxed feel, which is embodied in the choice of instrument and her upbeat strumming of it. Flannagan’s happy song caused discussion and praise from among our panel of songwriters. They felt happy songs are difficult to write. Farnan commented that Leah showed how much we can learn by singing covers, as we are deconstructing songwriting styles as we cover other people’s work. The challenge, however, is to develop our own writing style and structures as she has managed to do. Barnard then added that with set chord structures within music often songs can sound similar to other songs when there was no intention for them to. This can be a challenge within the form but it shouldn’t stop anyone from writing songs. And with that our first session came to a close. If you see yourself here or in the flick sets and want a copy of the pic, contact June Perkins. Get it all down: ‘whoosh’. Inspiration can be sitting right under your nose, and it can also come from sorrow and nostalgia. You can structure a song around a list about something, like reasons you are sorry. You can begin with the music and go looking for the words that match the mood of the music you are playing. You can also match the instrument to a song to create mood. Real life can seem stranger than fiction when you put it into a song, but songs can also be invented and not something biographical. Deconstructing other songs by covering them as a singer can help you understand songwriting. It’s important to develop your own style. It is fun to experiment with different styles and genres (jazz, pop, folk, country) until you find one or more combined that become your own style. Pay attention to ‘details’ in songs. I thoroughly recommend the Song Trails workshop to anyone contemplating it in future. Will be back soon for the next blog to explain how we made the group song. Wow, that was so exciting! To view pictures of the Song Trails workshop, visit Song Trails. You can visit June’s blog Unity’s Garden or catch her at Aftermath’s ABC’s Open Project. This blog will also be stored at Unity’s Garden as a record of her growing guest blogging gigs.